When bingo at Silveridge started back in the 1980s, it was the only place to play in the East Valley. Now, there are over a dozen others within a 20-minute drive, with four others on Wednesdays alone; yet Silveridge bingo still flourishes, occasionally getting as many as 200 players. I sat down with the two men who run the program to ask them how they keep it thriving after all these years. It stuck, and everyone involved works to make it so. The spirit of Silveridge bingo starts with the fact that all the callers and other staff are volunteers, and all profits go to support clubs and activities at Silveridge. (There are expenses, of course, and the State of Arizona, gets 1.5% off the top, but everything else goes straight to the Renters’ Association.) It falls to Rick Winter, who’s been Finance Manager for over six years, to make sure that every dollar is accounted for, including reporting quarterly to the state’s Bingo Unit. The total provided to the park’s clubs/activities now exceeds $200,000. 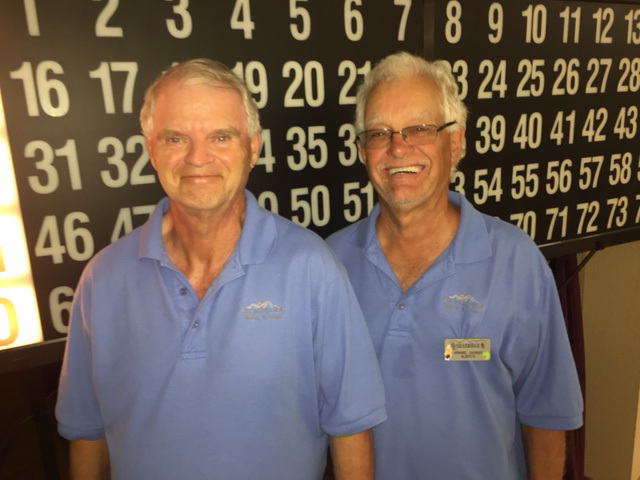 While the bingo evenings have been shortened, Armand’s and Rick’s bingo days are still long. Armand arrives about 2PM to begin preparations. Rick comes in about 10AM to start his work, then leaves and returns about 4. The volunteers arrive around 5 for a buffet dinner, then start selling cards at 5:30. If you’ve never played, or haven’t played in years, Armand and Rick urge you to stop by and say hello. The volunteers who will get you started and answer all questions. Bingo goes through March 22nd, which is also the last night for one of the group’s favorite callers.